I was so beyond tired yesterday I couldn't bring myself to blog about the amazing day I had in NYC on Tuesday. It started with my alarm going off at 5:30 am and didn't end till I crawled into bed at 1:30 am- the entire day it was go, go, go. The day started out with the Nate Show. It was fun to be on set, see Nate, and get to participate in all that goes on with taping talk show. I have to say that the Nate Show was fun, but it was also a big disappointment. I was expecting a Martha Stewart type blogging show but what we got was not ONE mention of it being blogger day on air- the whole show was not even about bloggers?!? The best part of the show was the 20+ min Nate spent after taping answering audience questions. He seemed real then, alot more relaxed. He seemed like a different Nate from when the cameras were rolling. 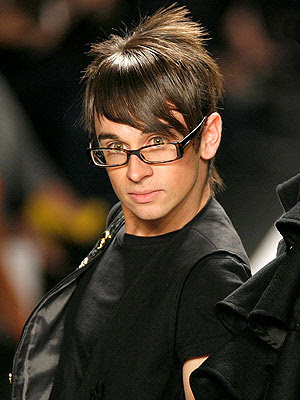 Oh, and also seeing Christian Siriano from Project Runway- LOVE him! But again, what does he have to do with the 90+ bloggers that were in the audience?!? Yea, not sure myself. After the not-one-mention-of-blogger-day Nate Show we were ushered out to the sidewalks where we chatted it up with other bloggers, snapped some photos and got ready for the after party. Yvonne from Design Vignettes (all the way to the left) couldn't make it to the after party but we snapped this photo as proof that the Boston bloggers were representing in NYC that day. Next stop was the Meatpacking district to the "Get Carted" party hosted by The Nest, thrown together last minute by the amazing Camila in only a few days! I finally got to meet Camila and Marianne and it was like I had known them my whole life. Seriously, it's so funny how talking to someone online and reading their blogs can form such a great friendship without ever meeting in real life. I miss you girls already!! I got to meet so many bloggers, but I know I missed alot as well which was a bummer. There was just so much to take in and I could have been there all night talking to everyone! All in all the Nate Show was a disappointment (as you can read and many of the other bloggers posts too), but I have to say that Camila and The Nest party totally made up for it! It was a long day for the Boston Bloggers in NYC, but it was well worth it to meet all my friends in person! We must do it again soon ladies, it was a blast! GLAD u had a blast lovey! Sorry I missed it! Looks like a fun time even if the Nate show was a dissapointment. 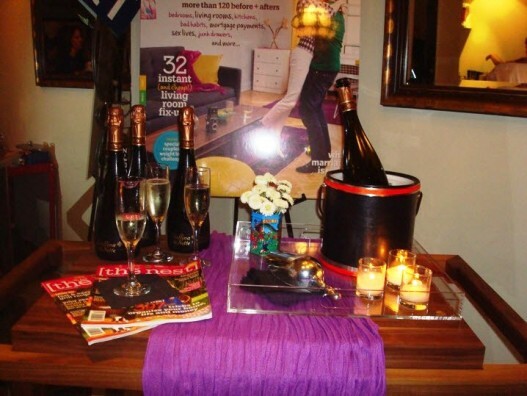 Loved looking at your fantastic photo's! looks like you all had a fab time here! So nice to get to meet you at the nest event! You are so sweet and I must say that little party was the highlight of my trip - it's certainly a great experience to match real faces and voices with the blogs you read everyday! A shame that the show didn't acknowledge the bloggers, but so glad to hear you were able to connect with fellow-bloggers and spend some quality time together. I am glad that you had a fun time, but I am really disappointed that they didn't recognize the bloggers. What a bummer. Have a nice day, and get some rest. I think its really bizarro they didnt mention the bloggers..esp considering such a strong force design blogs have in the industry now since virtualyl every great shelter mag out there folds. poo nate, poo. anyways, im majorly jealy you got to meet everyone! booo being so far away! What a bummer about the show! Well, it sounds like you bloggers didn't need ol' Nate to have a good time! Love your cart. Great shots. What a good time! Um, is it just me or are Nate's pants REALLY tight in that pic?? Let's hit up Sonic on Route 1 soon!! this was a big disappointment for all the bloggers involved but the nest party and the send the trend necklace kinda made up for it. I am sorry I didn't get the chance to talk more! Your pix are great. Sorry to hear the Nate show was a little disappointing, but it sounds like you made up for it big time at the after party. I was glad we had a moment in NY to connect with all of you, and I love seeing what happened after we had to dash off (how fun to do an impromptu design challenge for The Nest!) Sure I will see you around Boston in the future. #2 We should have taken a picture at Sonic!!! It was so fun to meet you (wish we could've talked more! ), and I enjoyed looking at you and Carlee in your cute yellow sweaters across the audience :) Hope you're getting rested. I'm definitely not yet! I already miss everyone! We have to come up with a reason to do this all again! I'm sorry the taping was so disappointing but it looks like you ladies had a great time after! Wish I could have been there to meet everyone. As someone who has just started blogging it really is exciting to start to get to know other bloggers with similar interests and make connections...what an amazing community! It was great meeting all the bloggers. Hopefully next time we can chat it up! so fun! well, the after party that is. So great to meet you! My first instinct was to give you a big ole hug. Hope you didn't mind me all in your personal space. HAHA! 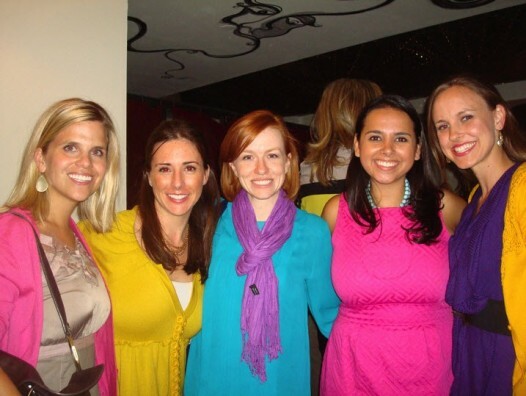 I've got a cute pic of you and the ladies on my blog. You can snag it if you want. Looks like you all had fun meeting each other! How fun to meet so many fellow-bloggers! Looks like it was a great day. p.s. you are adorable btw! !